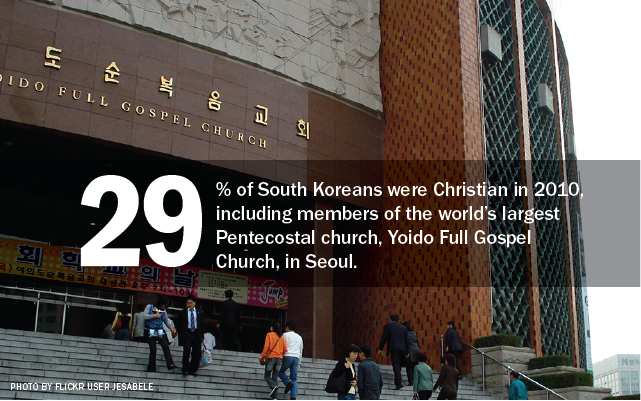 1South Korea has no majority religious group. Its population includes a plurality of people with no religious affiliation (46%) and significant shares of Christians (29%) and Buddhists (23%). South Korea’s current president, Park Geun-hye, is an atheist with connections to Buddhism and Catholicism, according to the Council on Foreign Relations. 3The majority of Christians in South Korea belong to Protestant denominations, including mainline churches such as Presbyterian, Methodist and Baptist churches as well as various Pentecostal churches. Since the 1980s, however, the share of South Korea’s population belonging to Protestant denominations and churches has remained relatively unchanged at slightly less than 1-in-5. 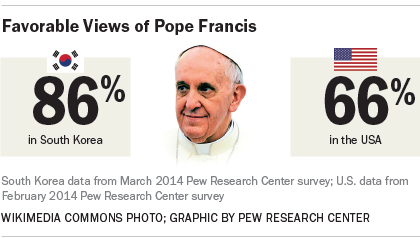 Catholics have grown as a share of the population, from 5% in 1985 to 11% as of 2005, according to the South Korean census. 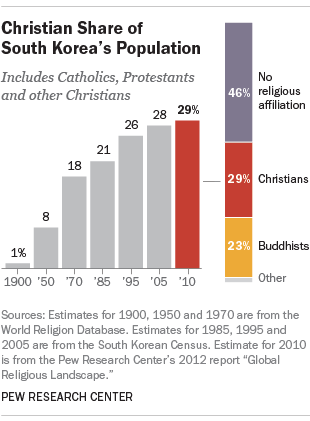 The growth of Catholics has occurred across all age groups, among men and women and across all education levels. 5The share of Christians in South Korea (29%) is much smaller than the share of Christians among Korean Americans living in the U.S. Nearly three-quarters of Korean Americans (71%) say they are Christian, including 61% who are Protestant and 10% who are Catholic. 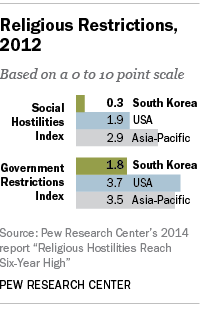 6As of 2012, South Korea had low levels of government restrictions on religion and social hostilities toward or among religious groups, based on our most recent analysis. In fact, religious restrictions in South Korea are lower than in the U.S., and significantly lower than the median level of religious restrictions in the Asia-Pacific region.